David Coulthard has called for more equality in the speeds of cars in the light of Mark Webber's spectacular crash at the European Grand Prix. "The discussion in the drivers meetings is that huge closing speeds is a dangerous thing on the race track," Coulthard said. "Obviously the Red Bull [has] massive top speed relative to the Lotus and it just catches the drivers out. "You don't want to have more than six, seven eight kilometres an hour difference between the fastest and the slowest cars. 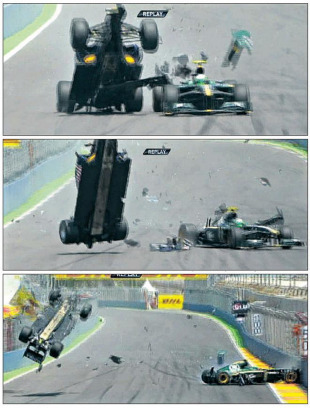 I think the FIA and the drivers and the designers will be having a conversation about that after this terrible incident." He warned the situation will be exacerbated next year with the possibility of a power boost system (KERS) and more flexible aerodynamics being introduced.